From your home or office, you can find out how your child is doing in his or her classes! In our ongoing effort to strengthen communication with parents, we wish to bring to your attention the Parent Portal of the Genesis Student Information System (SIS). The Genesis SIS will enable you to access your child(ren)'s grades, attendance, disciplinary infractions and other important information online. This access is available from the time you enroll in Willingboro Public School District until your child(ren) graduates. The Parent Portal link can be found under "District Quick Links" at the bottom of the District Homepage or bottom of this page. With your username and password, you can access the information previously mentioned. Web access to the Parent Portal is completely secure. Access is set up for individual families, and your access is limited to your child's records only. Starting with the 2019-20 school year secondary students (Grades 6-12) also have access to their own information with a Genesis Student Accounts, which limits them to see only their own information. This system does not replace face-to-face parent/teacher conferences, telephone calls, school newsletters, or the many other forms of communication that provide valuable feedback about your child's educational experience. Instead, it is a supplemental way for busy families to track their children's progress. To register for use of the Genesis Parent Module, you must fill out the Genesis Parent Portal Access Form and have your child return it to his/her teacher. You must complete all fields, including a valid e-mail address, in order to be granted access to the Portal. If you do not have an e-mail address, you can obtain a free one by registering with online services such as Yahoo! Mail or Google Mail (Gmail). Once we have received your completed form, Genesis SIS Department will create an account for you to access the system. Upon our completion of your registration information, you will receive, via e-mail, your log-in username, a password as well as further instructions. Please note that you will have the ability to change your password after you log-in to the Parent Module for the first time. And as always, please keep your log-in information confidential to protect your child(ren)’s personal information. If you have any other questions or concerns regarding the Parent Module, and its implementation, please e-mail Dennis Devlin at ddevlin@wboe.net. Please review the 'Parent User Manual' linked below, and we look forward to hearing your feedback on this method of communication. 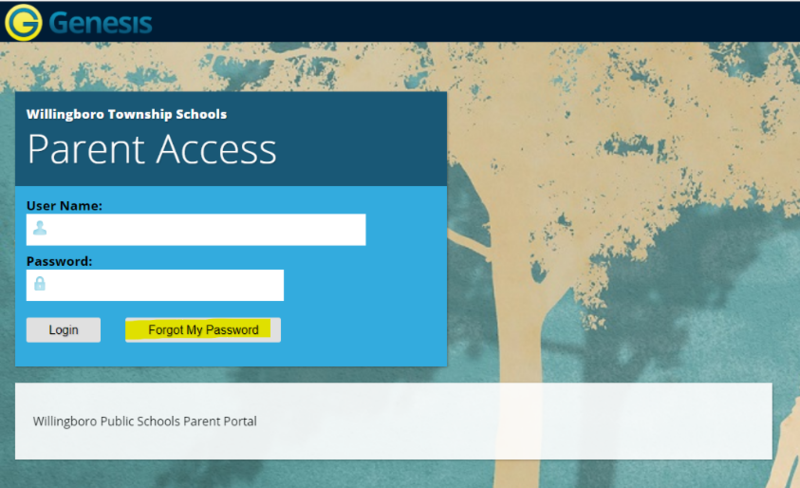 Before accessing the Genesis Parent Portal below , please take the time to review our Parent Portal User Manual. If you have forgot your password, please use the "Forgot My Password" button on the login screen.